I work near Utrecht and sometimes have to drive through this most traffic-unfriendly city. So I'm standing waiting for a green traffic light and I spot a poster. Reading the first four words 'Procol', 'Harum', 'Brooker' and 'Fisher' was enough. I U-turned right there and drove straight to the booking office and bought three tickets. It turned out to be without doubt the most superb pop / rock concert I've ever seen. And I've seen the Who (twice), the Stones, Yes (twice), Zappa, ELP, Floyd (twice), Dylan, Clapton, Santana, etc. Here is a part set-list, in more-or-less the right order. I've only included the songs I definitely remember the band playing. From a note I made at the time I see that a song was played which referred to a Spanish Lady: I suspect now that this must have been King of Hearts. Conquistador was played with the symphonic intro, with Matthew Fisher pretending to be a whole orchestra. The intro was similar to the original Edmonton LP. Shine On Brightly was an enormous surprise for me. The song has such a dramatic intro, and it just hits you totally unexpected. I had a serious attack of goose-bumps during the organ solos. Gary Brooker was in jovial mood, chatting to the audience. I remember the following: 'Matthew Fisher, my playing pal on-and-off for twenty-five years ... God, has it been that long?'. And there was a clear reference to a concert in Poland very shortly before, perhaps the previous day. Rear-admiral Brooker wore white spats and greased-back hair for the occasion. Matthew Fisher looked a little awed by everything. It's amazing to think that such a talented guy, with so much experience, still looks uncomfortable taking a bow to acknowledge the applause. Dave Bronze's playing was perfect. Mark Brzezicki was stunning, on which more later. And the guitarist appeared to be exactly what he was, a long-time fan of the band, filling his rôle superbly. His crunching power-chords in Whaling Stories were everything they needed to be. The band was very well rehearsed and road-proven. This became most evident during a rousing and raucous Little Queenie which thundered along like a well-oiled steam locomotive. The absolute highlight of the concert was A Salty Dog, which was played superbly. This band really is the Nureyev of Rock, combining power with poise, strength with subtlety, fire with finesse. The hall was mesmerised by this performance and there was hardly a dry eye in the place. I play music myself and believe me it's hard to play this slow without getting boring. The sound of the orchestral closing chord, with its rich string sound played by Matthew Fisher, will stay burnt into my memory forever. At the end of the main portion of the show the drummer was fooling around with some bits and pieces, so Gary Brooker got a little annoyed and said quietly that they should have started already. Then they launched into Repent Walpurgis. The second and final encore featured one song only, which everybody had obviously been waiting for. Although unflawed, it was a slight disappointment, in the light of all the magnificent music that preceded it. Of course it's nice to be able to say 'Oh yeah that song ... I've heard it live' but it wasn't enough. During the final farewell applause, my wife nudged me and said 'That drummer is so good, I want to shake his hand'. We were in the sixth row by the centre-aisle so I stepped aside and said 'Go!'. She went down to the edge of the stage, looked commandingly at Mark Brzezicki with her fierce brown Italian eyes, stuck her hand out and shouted 'Drummer!' Mark sprang obligingly forward (who could refuse?) and shook her hand. Sensing a moment I leapt after her and called out 'Matthew!' who came to shake my hand. 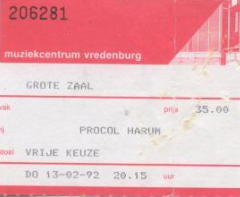 You can guess the rest: within a few seconds half the hall was shaking all Procol Harum's hands. And we all went home on a high which lasted for days.